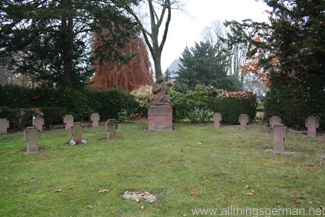 And yet they are there, as I recently found out on a guided tour of some of Oberursel’s memorials. My British image of a war memorial is a place where services are held on Remembrance Sunday, and where the names of the people from the local town who died in either the First or Second World Wars are listed – sometimes even later conflicts like the Falklands War. ie. one memorial per town. Oberursel at least has a whole collection of them! There are a number of reasons for this, which I will go into in a moment. One of them, however, is because various villages were merged into the town in 1972. These had often erected their own memorials, adding to the number. A similar case exists for Bommersheim, which merged with Oberursel in 1929. 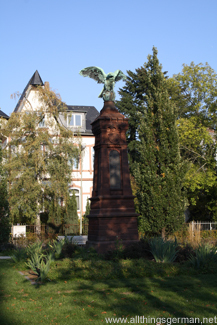 In Oberursel itself the story starts in 1871, with German unity and Napoleon’s defeat. (The same defeat that led to the building of the Niederwalddenkmal near Rüdesheim). 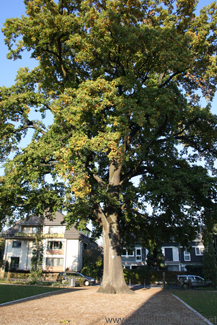 In the “Allee” (now Adenauerallee) a tree was planted soon after the victory and called the Friedenseiche (peace oak). The location is not a co-incidence, because the veterans’ association held their meetings on the opposite side of the road in a pub called “Alemania”. 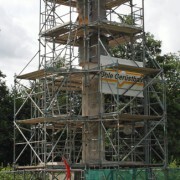 The tree is still standing and is listed as a natural monument. A year later in 1872, a committee was formed to arrange a more traditional type of monument, but due to internal differences this was not erected until 1895. It is reminiscent of the type of monuments built in the UK after the First World War in that it is contains lists of names on each side. On the top is a sphere with an eagle sitting on it – the eagle is looking towards France. The other 69 names are people from the town who survived and returned, many of them on the aforementioned committee. Reading those names there are many familiar surnames of the families who still play a large role in the town. Following the First World War the situation was understandably different. 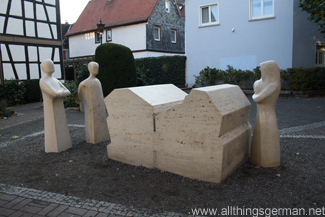 This time Oberursel lost 230 of its citizens, and they are listed on the base of the Ehrenmal – a mosaic-clad column next to the Christuskirche in the Oberhöchstädterstraße. 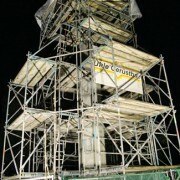 This was officially unveiled in 1930 and is currently undergoing restoration. However after the Second World War no new names were added, the Ehrenmal remains a war memorial only for the First World War. 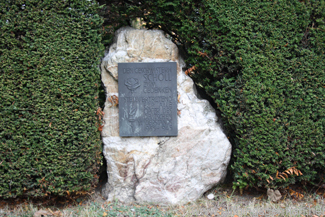 Instead, a memorial was erected in the 1950s in the cemetery on the border between Oberursel and Bommersheim as a place for people to go and remember their friends and relatives who did not return either from one of the battles or in some cases from captivity. Apparently this simple stone was overgrown for many years, and only recently has the area around it been made accessible again. 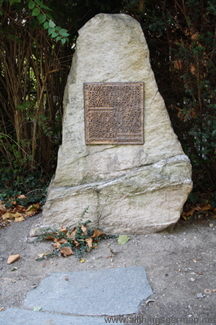 Other more specific monuments or plaques can be found throughout the town, such as the location of the Synagogue in the Weidengasse, one for displaced persons at the Waldfriedhof or at the Jewish Cemetery near the swimming pool. Behind the cemetery in Bommersheim there is also a plaque for Hans and Sophie Scholl, representing the members of the German resistance who lost their lives. 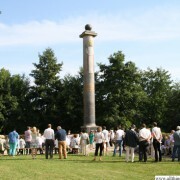 And now Oberursel has a new memorial – the victims’ memorial (Opferdenkmal) in the grounds of the old hospital in the Strackgasse. Funded by donations, it is being put together piece by piece, and is for “die Oberurseler Opfer des Nationalsozialismus”. Those who it commemorates died in concentration camps, as a result of torture in the town itself, or by committing suicide to avoid deportation. The monument has two sides with a number of figures on each side. One side represents the victims, whereas the other represents the people of the town looking on. When it is finished, a sheet of glass will separate them and will be engraved with the victims’ names. Walking through the town and learning so much about the different memorials it was a strange feeling to realise that they had been there for so long, and yet I had either not noticed them or had not stopped to look at them further. But have walked or driven past them so often since I have lived here. I am sure that many people living here are not aware of them. you forgot to mention the memorial to the victims who were forced to leave and never came back next to the Hauptfriedhof…I have only lived here for six months and have seen most of these memorials…American Veteran living in Oberursel….